Open Arts Community Choir celebrate 18 years of song. Enjoy an evening of eclectic choral music by European Choir Games gold medallists, Open Arts Community Choir, hosted by Máirtín Ó Muilleoir MLA. Listen as award-winning broadcaster John Toal interviews singers with and without disabilities about their personal experiences and memories of competing at festivals, performing on prime time TV and international stages from Armagh to America and Lisburn to Latvia. With fresh interpretations of classical standards alongside glorious choral arrangements of rock/pop classics and folk songs; the choir demonstrate an extraordinary level of accomplishment through repertoire which is almost as diverse as their singers! 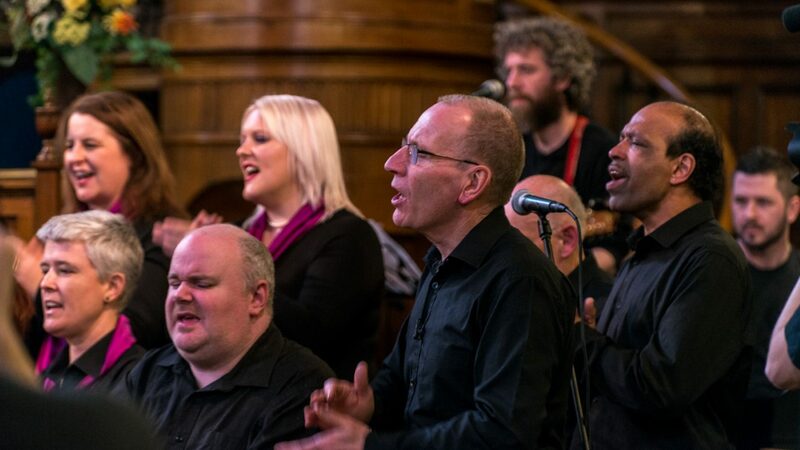 The choir is part of Open Arts, an arts and disability organisation whose vision is a society that actively values and promotes the creativity and artistic contribution of disabled people. All guests must enter Stormont Estate via Massey Avenue.